Our fan back Ironica side chair, here in a white, takes the classic Ricker style fan back chair form and reduces the ornamentation in the spindles to give this dining chair a more updated, modern look. Let the rustic romanticism of the Ironica timber dining chair, here in the white finished beechwood, add charm and modern sophistication to your space. Made from European beechwood including solid beechwood legs and spindles, the Ironica is built to withstand regular use in your busy home kitchen and hold up to the wear and tear of family life. This outstanding dining chair comes to us from TON CZ, renowned European furniture crafters. No shortcuts have been taken in the design or construction of this attractive and sturdy classic kitchen chair. Put these chairs in your modern kitchen, your upscale dining room, around a child's worktable, at the desk of your kitchen workstation, in your French country home office space, as a side chair in your guest room with the pretty throw draped over it--the possibilities are endless with such a classic, well-informed design piece. 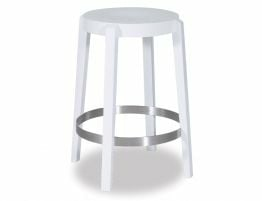 In this white finish, our spindle wooden dining chair would look great in your all white kitchen. 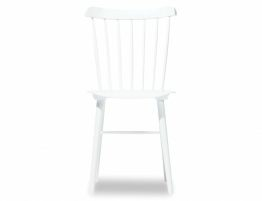 This white wood kitchen chair or dining chair offers standout style, superior construction and lasting, on trends look. 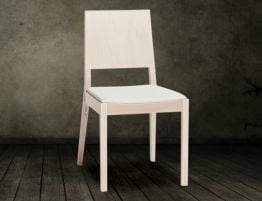 The seat of our Ironica white wooden dining chair is saddle shaped for comfort. Our fan back wooden side chair has details that make it unique but not overelaborate. Our wooden kitchen chair offers a lasting style that makes it a must have in your kitchen or dining area. Our Ironica timber rustic dining chair gives us delicate spindle details and graceful tapered legs that make this wood chair fetching. The Ironica while a striking chair, is absent of any excessive embellishment that can date a wood chair very quickly. 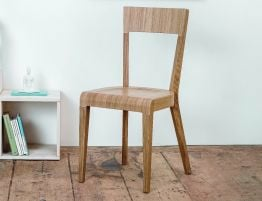 Our elegant, timber dining chairs are simple, even handcrafted looking, but it is a refined handcrafted look that works very well with many different design tastes. Our graceful spindle back chair offers a classic refinement that will keep this dining chair feeling current and fresh for its lifetime.